West Hills Homes NW Launches Groundbreaking Ceremony Featuring 50 Students from Local Elementary. PORTLAND, Ore. – April 8, 2016 – West Hills Homes NW launched its new business and first development in the Bethany/Bonny Slope area on Friday, April 8, 2016. The West Hills Homes NW team celebrated this 40 home community called Findley Heights, with a special groundbreaking ceremony 9 a.m. – 10 a.m.
To honor the neighborhood, which borders Findley Elementary School, West Hills Homes NW invited 50 kindergarten and 3rd grade students to help break ground. The West Hills Homes NW team met the students at Findley Elementary School before walking to the nearby construction site. 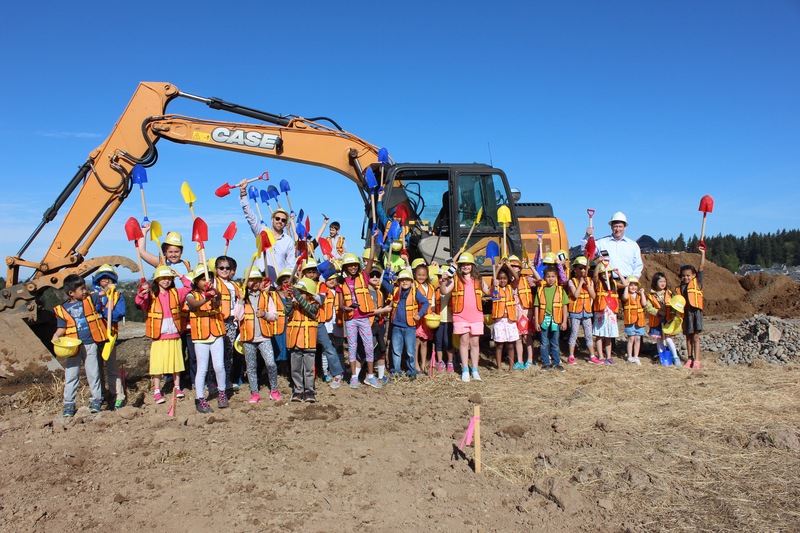 These Findley Elementary students, outfitted with hard hats, construction vests and mini shovels, got their hands dirty working alongside the team from West Hills Homes NW. “I could not be more proud of the top notch crew we’ve pulled together at West Hills Homes NW. In total, the leadership team has over 100 years of combined knowledge in the homebuilding industry and we’re excited to bring this experience to the budding community of Findley Heights,” commented owner and founder Vic Remmers at the groundbreaking ceremony. The Findley Heights community will include 40 new homes constructed by West Hills Homes NW’s locally owned and operated team. Once the first model is completed, homes will officially be available for sale in the summer of 2016. Each Findley Heights house will be Earth Advantage Home Certified and will include a 1 year full warranty for homeowners. Driven by smart community planning, West Hills Homes has carefully sited and thoughtfully designed each Findley Heights home with all homebuyer lifestyles in mind.